In the latest in this new series, Dudley shares his memories of fifties and sixties rider Jackie Biggs. We want to feature similar articles on riders from any era of the sport's rich history. If you'd like to contribute a piece then email us at speedwayplus@hotmail.com or fill out our form here. Jackie Biggs had been about a few years when I first witnessed the sport in 1962. He had been a man of many teams, and mixed fortunes. Jack is probably best remembered as being the man who was the person who came closest to being world champion without actually winning, only to tear defeat from the jaws of victory. As many will know Jack scored a maximum 12 points from his first four rides in the 1951 championship, and needed only a point from his last race to take the title (closest rival Jack Young, had amassed only 12 points from all five of his rides). Finishing last in Heat 19 still left him with a run-off for the title where, once again, he came in last behind Jack Young and Split Waterman. However, my personal memories of Jackie are quite different. By the early 60's Jacks days of stardom were long gone, and those of the old National league were numbered. 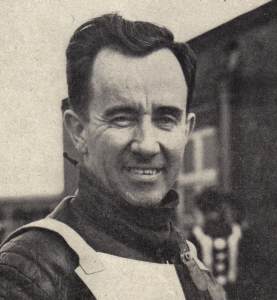 Jackie was still in the top flight (in those days riders rarely raced at two levels concurrently), but he was mostly reserve for Coventry Bees. Now Coventry Bees were our 'bogie' team at Norwich. Norwich consisted essentially of a couple of big stars, and a longish tail. Coventry, on the other hand, had less in the way of top men, but were considerably more solid. What tended to happen was that Coventry would let Fundin, Nygren and Betts (or Hedge depending on year) go for the win, while they just closed in behind. All this made for tense last heats, and this is where Jack came in. Typically Jack would score the odd point, until that last heat decider. Waiting on the terraces for the announcement of the riders for the last heat, we tended to get used to hearing those fateful words 'reserve Jack Biggs will replace so and so in the final heat'. As the tapes went up, and it didn't matter how good the Stars representatives in the race were, Jack would get the start to end all starts, and proceeded to scorch away for a win, securing the match for the Bees. Jack, of course, rode on after the formation of the British League in 1965. In fact the amalgamation revitalised him, as it did several others. Very sadly, and I believe it was in the early 1970's, Jackie, now well over 50 years old, was killed in a track accident in Australia. He may not have held the World Trophy, but he left me with memories and respect for the ability he still, occasionally in the 1960s, could show when it counted. It occurs to me that the experience in 1951 might have taught him to save the best for the last ride of the night! Submit Your Own Article on a "Rider to Remember"
"Jackie Biggs.....my favourite rider when I supported the Harringay Racers in the early to mid fifties. Jack lived on Muswell Hill in North London, and he very 'generously' allowed my friend and I to wash his car, a 'woodies' estate car. I was at Wembley on the night Jack very nearly won the world championship, we had top price seats supplied by Split Waterman. As we know, Jack Young became World Champion that night with Split Waterman 2nd and Jackie Biggs 3rd. I was just ten years old....and I admit I cried!" "My Old Man reckons Jackie was the best Solo Rider he ever saw. My recollection of Biggs death was January 1971 or 1972, I was 9 or 10 holidaying in Caloundra (from Melbourne). I believe it happened at the Ekka and the wording in the paper as I recall it was.....Biggs fell, hit the fence and rolled off onto his stomach; by the time help got to him he was dead. He was either 51 or 53 at the time. I'm working from childhood memory so I can't assure the accuracy." "I first watched Jack Biggs in Melbourne along with Neil Street and the mighty John Dewhurst [probably the best aussie rider not to venture overseas]. Jack was always immaculate in himself and his machinery, we had access to a small training track and Jack / Neil and Phil Crump would be be there any time. Quite amazing for ten year old me to see world stars going through their paces.What a Champion Jack Biggs was......."
"Firstly to the person who wrote this article, thankyou very much! Jack is my grandfather, I never met him and have only heard a very few stories of him from my Nanna (Sheila Biggs). It's fantastic to find a little more about his success and my family history. If anyone would like to share any stories or memories about my grandad Jackie Biggs, please email me and let me know. redmanj@optusnet.com.au"
"I was just a kid about 12, when Jackie used to arrive at the track at Poole in mid sixties I think. I can remember him taking his bike off and he used to carry his bag and he let me push his bike to the pits. Then he would sit on his stool and i can remember him cutting the corners off the grips of his brand new tyres. Because I was only a kid I asked him why he was doing it and he said to get a better grip. He would let me stay there until racing started, give me a couple of programmes and some elasticated goggles that they wore so that meant I got in free. I used to do that quite often when he was riding at Poole. I can see his bike now. All the chrome was lovely and shiney. By what i can remember he was a bit of an idol amongst the fans. With the money I saved from getting in I would spend on chips and eat them on the bus on the way home. Also I used to do the same with Ronnie Moore when he used to come down to Poole to ride. Two great speedway riders and men. " "My dad John (now deceased) used to continually tell me about how good Jackie Biggs was and how well he could get a bike going, from what l can gather they were quite good friends and used to always be at Tracy's speedway in Melbourne. In dad's latter years he would always tell me about 3 bikes that Jackie built, they were a bit different, from what he said they had the tank under the seat? Dad searched for one of those bikes for many years and thought he had finally tracked one down in Bendigo only to be disappointed once again. He gave up in the end, if anyone has any news or knowledge of these bikes l would love to hear about them. From what l can gather they were put together in a garage in Preston or a garage near the Flemington show grounds." "I am 75yo. My father who raced midgets at Olympic Park pre-war started taking me to Maribyrnong Speedway from about 1948. Dad said Bill Rogers was the best rider he had seen but changed his mind when Jackie Biggs returned from England after his first season away. In those days they had handicap raced over 4 laps for solos and Jack was always the back marker. He was often giving starts of three quarters of a lap and still winning. He beat the current at that time world champ Vic Duggan in a match race series and completely thrashed Aub Lawson at the same track. He had the petrol tank under the seat and I believe he was the first to do so. Was I a fan?, ABSOLUTELY. He made speedway solos for me. To see him last in a field of seven in a handicap with a lap to go made the hairs stand up on the back of your neck watching him overtake the whole field. Boy the crowd loved it. I note my son Jim wrote a previous article on this site. I think he was wrong about the cause of Jack's death. My memory of the facts told to me was that Jack fell off and was hit by a novice rider's bike. Probably that is why these days professional riders will not ride against novices and I think that is written into their insurance policies." "Greg McNeil, now there is a blast from the past. I believe Jack's life was taken at Bendigo Vic. An accident involving Tony Melrose, I believe. I also remember Len Biggs, and he had a son called Alan Biggs, so the name lived on. I can remember buying a Jackson cam (for my JAP) from a person who had a lot of Jack's Speedway gear, but cannot remember his name. I also remember your Brother John, coming to Tasmania with Neil Street, a long time ago, I believe that John was (17) at the time. God to read some posts on here, yes Jack was a legend for sure. " "I knew Jackie Biggs when I was a kid, his workshop was at the top of Elmhurst Road in Tottenham. He was a terrific bloke, I used to mingle with him often. He also used to take me home in East Finchley where his wife Sheila would feed us, very nice lady. He used to work there after the garage closed where most riders would have their engines rebuilt by him. The most helpful man you could ever wish to meet and fondly remembered."